Sumo is a violent sport whatever one may think, and if a weak person would fight an overly stronger opponent, it could easily endanger his life. It is not mentioned often, but the truth is the force of the tachi-ai could easily break the cervical vertebra of an ill-prepared wrestler, sending him to the other world. The NSK is well aware of that risk and very early on imposed minimum physical requirements for those who wish to enter professional Sumo. The bar was placed at 173 cm as the minimum height and 75 kg as the minimum weight, which is verified during the first medical examination of the candidates. This precautionary measure seems valid but nevertheless unjust towards teenagers of small stature who remain stranded some centimetres below the limit. Some of them bypassed the ban by putting their health seriously at risk. The gimmicks used ranged from simple blows on the head just before the measurement, to surgical insertion of silicon implant. In any case, young people risked their lives so they could become real wrestlers. 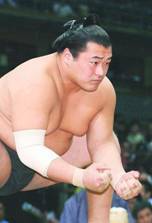 The success of tiny Ozeki Daiju in the 1970s and the technical brilliance of Komusubi Mainoumi in the 1990s have finally convinced the NSK heads that there were worthy wrestlers of small stature. 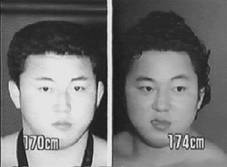 So with the aid of Keio university, the NSK had found a way to give them a second chance, and in March of 2001 an announcement brought joy to many future wrestlers, among them current Maegashira Toyonoshima: a second examination was established for the candidates, aged between 16 and 24, who are at least 167 cm tall and have at least 67 kg. Those that fulfil these secondary conditions are then given the chance to pass eight physical tests and, according to their results, a jury will decide if to admit these new recruits. Here are the eight works of Hercules, which only the "small" recruits have to pass. It is important to note that some of the following tests, such as the measuring of grip and back strength, are already part of the first medical examination and moreover, are repeated once a year during the wrestlers' whole career. This first test consists of evaluating the performance of back muscles in traction. 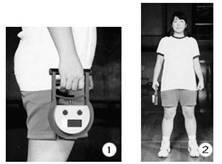 To measure this back strength, the NSK uses the apparatus in the picture, especially conceived for this purpose. It works like this: as shown in the photo, a wrestler places both his feet on the tray and grabs the two handles, careful to keep his arms and legs stretched. The digital display still shows zero. Then, from this position, the candidate pulls the handles towards himself, still keeping his arms and legs stretched. During this move only the back muscles work and the apparatus, which works as a spring, converts and displays the force applied by the candidate in kgf (kilogram force, 1 kgf = 10 Newton). In this exercise, the most gifted recruits can reach 200 kgf, which would make them strong enough to execute tsuridashi (carrying the opponent) or to resist opponents' pushes with their feet locked against the tawara. 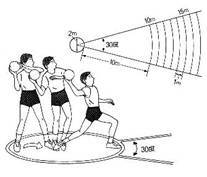 The second test is a simple throw of a handball, which the candidates do twice in a way shown in the sketch. With an area of 2 meters in diameter at their disposal to gather momentum, the candidates have to throw the ball as far as possible in an arch with a 30� angle. 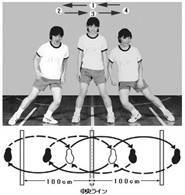 In this test the recruiters watch the performance of muscles which enable execution of powerful throws as seen in the techniques "uwatenage" or "shitatenage". The future Yokozuna Asashoryu in the middle of the grip strength test during his recruitment. This third test is of utmost importance for the wrestlers' future career, especially for those who will adopt the yotsu style (wrestling body to body with a grip on the mawashi). In this test the grip of potential recruits is evaluated, trying to determine how well they will be able to grab their opponent's mawashi so that he will not be able to break their hold. 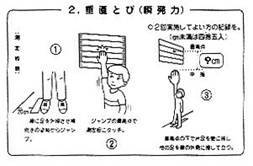 To do that, the NSK uses a little hand-held apparatus, as shown in the pictures. The candidate has to close his fist as strong as he can, and the apparatus registers the maximal deployed force. For your information, common mortals have a grip strength of 50 kgf, but the greatest mawashi specialists largely surpass that value. Currently Kaio is the uncontested master as far as the grip is concerned, with100 kgf for his left and 110 kgf for his right hand. Able to crush an apple in his hand, Kaio doubtlessly boasts the most powerful fists in Sumo history. But the grip is not everything... On the contrary, with an average grip force of 50 kgf for both hands one can have a fine purely yotsu career, as demonstrated by the 66th Yokozuna Wakanohana, who was able to compensate for it by the strength of his legs! Wakanohana, weak grip but mighty thighs! This test lasts exactly 30 seconds, and in that time one has to do a maximum number of Japanese sit-ups, as shown in the photos. The knees have to be bent at a 90� angle, and the arms have to be crossed across the chest. Then, the number of times a recruit starting from a lying position can raise his body to his knees in 30 seconds is counted. In general, this test is performed with the aid of a third person, who holds the candidate's knees. This exercise of jumping from a crouch is very widespread in volleyball world. A blackboard with gradation of height is placed on the wall. The recruit puts chalk on his palms, takes a position 20 centimetres away from the wall, and jumps to hit the blackboard as high up as he can. Then his height is deducted to determine the height of jump from crouch. It should be noted that recently it became possible to perform this test in a more modern manner with an apparatus that assesses the time spent in the air during the jump and derives the maximal reached height from that time and the subject's weight. Similarly to the fourth test of sit-ups , this sixth trial is also dynamic and short as it measures the power of new recruits in their lateral movements during only 20 seconds. As shown in the sketch, three lines are drawn on the ground, one meter apart. The future wrestler starts this test standing on the centre line, with his feet apart on either side of the line. Then he jumps to land with his feet on either side of the right line. After that he continues the movement by aiming for the central and then the left line. The goal of the trial is to perform a maximal number of lateral leaps during 20 seconds. For this seventh test the candidates have to show their speed by running a 50 meter sprint. Of course, the race is timed with a precision of one tenth of a second. The only peculiarity of this sprint is that the sprinters are required to run at full power for 5 meters after the finish line for their race to be valid. The recruits have only one try. This final test is doubtlessly the most difficult of all. It is a test of shuttle-like running developed in 1985 by Canadians L?ger and Boucher, in order to determine the maximal aerobic* speed (physical effort while breathing), and also the speed where the share of energy supplied by anaerobic* system (physical effort without air) becomes more and more significant. Basically, two lines are drawn on the ground 20 meters apart, and the recruits begin a race from one line to the other. This race is uninterrupted and the rhythm is given by a third person who sounds a periodical signal. The candidates have to reach the opposite line before the signal stops. The signals (usually given by a whistle) at the beginning of the race are timed to impose a 7 km/h rhythm, which keeps increasing by 1 km/h every 2 minutes. In short, the more one runs the faster must one go. At the end, simply the number of rounds a recruit has managed before being eliminated is used to evaluate his performance. The muscles need energy to work. This energy can be secured by different systems. The aerobic system uses oxygen from air which is circulated to muscles by blood; this is the primary of systems used by the muscle. The anaerobic system is used by the muscle in second half, when the aerobic system alone can no longer satisfy the need for energy, and it does not use oxygen. To decide on the destiny of these men of short stature, the NSK uses the data supplied by the Monbusho, the Japanese Ministry of Education. Since these tests are standard and school children go through them yearly, the requirements were fixed based on the national statistics on male 18-year-old pupils. The recruits aged from 16 to 18 years have to place better than the weakest 30% of this populace while the recruits from 18 to 24 years have to be better than 50%. The complete criteria are summarised in the table, together with the average performances of 18-year-old Japanese. As one can see, the minimal requirements are quite weak, since the average 18-year-old Japanese can fulfil them without any problems. The true selection is made afterwards, in the heya. In the end it has to be added that these physical tests are organised three times a year, in the den of sumo - Kokugikan in Tokyo, just after the January, May and September tournaments. 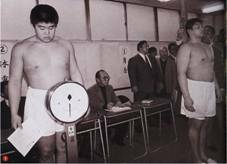 The NSK also organises a complete health examination for each of its wrestlers, Sekitori or not, every year in February. Alongside the blood tests and measurements of blood tension, weight and height, the wrestlers test themselves with a grip strength test and a test of back strength.